An excellent choice, both for renovation and new construction. Epoxy flooring is one of the most used industrial flooring. 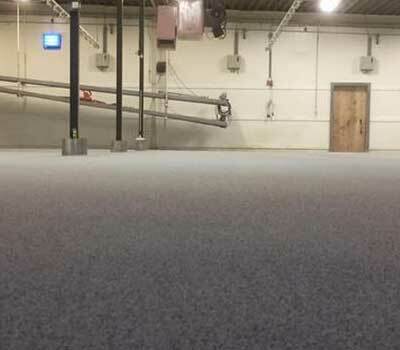 Because epoxy floors are twice as strong as concrete floors and liquidproof, it is ideal for situations where high chemical and mechanical resistance is required. Partly because the epoxy floor can be installed seamlessly, it is easy to clean and low maintenance. After all, it is waterproof and dirt or liquid can’t nestle anywhere. Would you like more information about epoxy floors? Or personalised personal advice? Contact Mesa Coatings experts now. Epoxy cast floor or epoxy coating? As you may know, there are many synthetic floors containing epoxy or where it is used as a base. There is the epoxy cast floor, for example, and epoxy can be used in a quartz carpet floor as well as a trowel floor. However, epoxy coating is often referred to as epoxy floooring. This coating is a floor finish and is applied in a thinner layer than a cast floor. The advantage of the cast floor is that it erodes irregularities in the ground and is therefore suitable for renovation. With a coated floor, less material is needed when it comes to a flat floor and the price per m² will automatically be reduced. An additional advantage of a thinner layer of floor coating is that it cures faster than a cast floor and is ready to use more quickly. For the application of an epoxy floor, two components must be mixed accurately at the workplace. This involves a number of risks that our specialists are aware of well-trained in. It is therefore strongly advised not to apply an epoxy floor yourself. 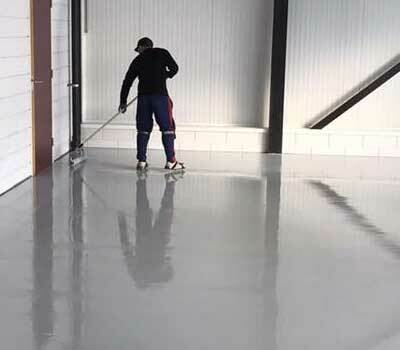 Furthermore, partly due to the thin layer of epoxy floor coating, the substrate has to be pre-treated, both during renovation and new construction. The subfloor must have the correct smoothness or roughness for optimal adhesion between substrate, primer and floor coating. For this we often sand the floor with diamonds before the coating is applied. However, this depends on the type of surface. To see which pretreatment and type of floor suits you best, we like to explore the possibilities with you.